I am SOOOOOO excited. I've been wanting one for quite some time...ever since I started taking a lot of pictures with my point-and-shoot and realized that no matter how much I fiddled with the options, I couldn't get the pictures as clear as I wanted. Especially in bad lighting. I got the gift a couple weeks early (our anniversary isn't until June 21st) because there was one available for a good price right now and Dave wanted to make sure I'd actually like it. 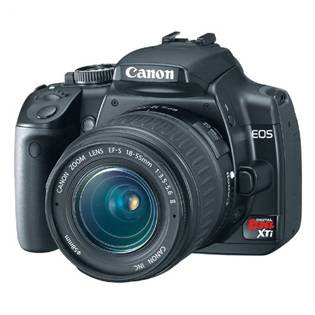 It's a Canon XTi Rebel. Check it out. My dad used to do professional photography, and he's always used a Canon. That means he has a bunch of lenses I can borrow and play with. Sweet!!! We have this camera. It is FANTASTIC and pretty easy to use, too. You'll love it! Oooo, fun! That looks like a pretty spiffy camera!